Water causes millions of dollars in residential damage each and every year. From major basement floods to mold and mildew growth to foundation damage, water-related issues affect thousands of homes. In many instances, these problems can be avoided. 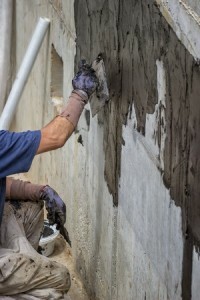 Unfortunately, though, many homeowners simply don’t realize just how severe moisture in the basement can be, nor do they know that most of these problems can be eliminated or prevented by basement waterproofing services. Here at Larry & Sons, we are proud to offer professional waterproofing in Hagerstown and the surrounding areas. A wet basement is certainly a nuisance, but the problem goes far beyond a simple inconvenience. When you basement is damp, it becomes an ideal breeding ground for mold, mildew and fungus, all of which can lead to severe respiratory problems. In addition, a wet basement can lead to structural issues, including major problems like foundation damage. Constant moisture in your basement causes damage to things like furnaces, water heaters, washers, dryers and anything you have stored in the area. The damage may not be apparent immediately, but it is constantly getting worse. The worst part? Homeowner’s insurance usually doesn’t cover flood damage. That means that, if your basement floods, you’re on your own unless you have separate flood insurance. Why risk the damage? Have your basement professionally waterproofed now! Basement waterproofing is generally a pretty straightforward process. At Larry & Sons, we pride ourselves on providing customized and highly customized solutions. If you are tired of dealing with the expense and frustration of a wet basement, contact Larry & Sons now for professional basement waterproofing in Hagerstown. Call 301-733-5428.